CANN & CLARKE To 11.05.1894 when sold to Morgans. Note that three licensees are listed at KINGS HEAD, Wymondham in 1794 - could one be in error for KINGS ARMS and the other at another Forehoe location? Image supplied by Philip Standley. Sold by auction 7th June 1751 - Auction held at Dukes Head Tavern, Gt Yarmouth. The Norfolk Chronicle of 1st December 1781 reported that on ` Sunday last died, Mrs Wright, who kept the Kings Head Inn, Wymondham, near forty years'. Included the Excise Office in 1830. In 1830 the coach the TELEGRAPH called daily at 8:00am on route to London. It returned every evening at 7:00pm. 80 members and friends of the Ancient Order of Foresters celebrated the 7th anniversary of the Court of Loyal Windham, No 2904, here on Thursday 19th May 1864. An excellent dinner was provided by the Host, Mr. Mullinger and several good songs were sung by the company during the very pleasant evening. Mr Mobbs held a farewell tea on 8th March 1877. On 10th October 1877 the excellent Household Furniture and Effects of Mr. Aaron Mobbs, were offered for sale, since he was giving up the Inn. 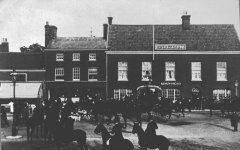 As the KINGS HEAD COMMERCIAL INN & POSTING HOUSE in 1879. Offered To Let with Possession from Michaelmas 1882. With the coming of the railway, a horse bus ran from the inn to meet every passenger train. The property included a meadow (today used by Wymondham Town Football Club) & bowling green. A note from the Hon. Sec. F. Clements dated 5th February 1900 announces that the AGLM will be held 26th April 1900 at 8:00pm and that the green will open Wednesday next at 2:00pm, for a match to be played between two teams, selected from members present. 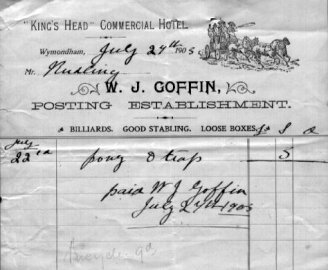 Billy Goffin was the last licensee. Site became occupied by a Woolworths store. See page 14 of `Wymondham in Past Times '. Thanks also to Robert Campbell. Further thanks to Peter Standley Sept 2007.